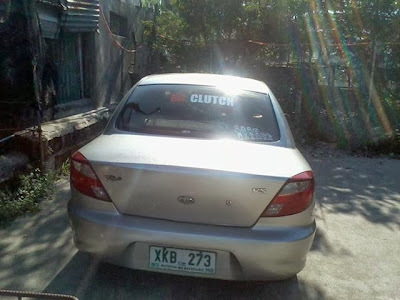 I bought a 2003 Model Kia Rio last Saturday. A mileage of 82,000 with no issues at all on its engine. It does serve its purpose for me, to reach point B. After being hesitant of the brand since I'm a big fan of Honda and my first option really about buying a second car. First thing I do first is to put a sticker at the back glass and this is how it looks like.